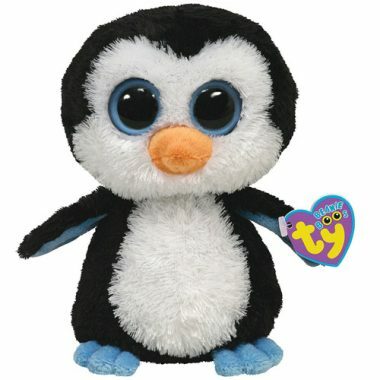 Waddles is made from a fuzzy black material with a white face and belly. He has large blue and black button eyes and a bright orange beak. His feet are made from blue material. Waddles was introduced on 1st October 2009. This is the regular 6″ version of Waddles. He was also released as a larger 9″ Beanie Boo Buddy, in a 16″ size, an even larger 32″ size and as a key clip. This is the second version of Waddles with blue feet. The original version had orange feet.